President Abraham Lincoln gave his Gettysburg Address on the afternoon of November 19, 1863 on the ceremonial occasion of the reburial of Union soldiers, and approximately 4 1/2 months after the Battle of Gettysburg had been fought. Asked to make a 'few remarks', and feeling ill with headache and subsequent fever, Mr. Lincoln may have given his ten sentences that summed up the war and echo through the centuries while suffering with a mild case of smallpox. The first Wikipedia link, above, provides the text which takes little more than the shake of a lamb's tail to read but of course you know how Lincoln ended his just over 2-minute Address--with, "--that government of the people, by the people, for the people, shall not perish from the earth." Since beginning Stars Over Washington on October 16, 2005, I assert that this has been my clear blogging objective as well while holding on to a sovereign United States of America. Yet there are forces, ancient forces, that remain determined to overtake and dissolve our nation's sovereignty and as we see in the 'New Millennium', they are now far along that path. Our educational system, financial system, religious institutions, family traditions, and the US government have been under attack for many years with a goal of using our nation to set up a global government, what some call a New World Order; a "revived Roman Empire." some say, and the last on planet earth. Perhaps you're aware that Bush Sr considered his 1990/91 Operation Desert Storm invasion as a heralding of the 'new order' so here's a handy timeline of the events leading up to the invasion though you'll find no NWO mention on its list. 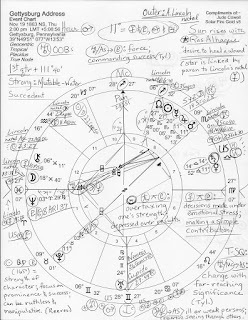 So with recent interest in Steven Spielberg's Lincoln film stoking the Lincoln legend (based on the book by Doris Kearns Goodwin), I thought you might wish to view the horoscope of Lincoln's Gettysburg Address with a few brief astro-notes--a bunch of my scribbles marked on the chart (please click image to enlarge.) Mr. Spielberg gave the keynote address at the 149th anniversary of the Gettysburg Address which was an honor for him as it would be for anyone. ABC news has details of the event here if you missed it. Rising in the Address horoscope is Mr. Lincoln's natal Venus in Aries, ruled by war planet Mars, and with the Address' rising sign, his illness is denoted by Pisces, sign of contagion and infection (it may have been smallpox). Horoscope: Lincoln's Gettysburg Address November 19, 1863 2:00 pm LMT PA; Hour of warrior Mars which conjoins Jupiter 11Sco13/57 in 8th house of Death along with Mercury (oration) and Sun 27Sco00 (leader) which conjoins the Moon's North Node @27Sco48 (public contact); Sun in Nodal degree indicates a fated or karmic encounter for the President and the people including the millions who read his brief speech in newspapers across the country quite soon after it was so modestly delivered. Our nation's last Saturn Return was a three-fer as well: December 3, 2010, March 22, 2011 (Rx), and August 28, 2011--all during the Obama administration. And you know how August 2011 turned out with the self-inflicted credit downgrade thanks primarily to Republicans and their spiteful antics, plus, a deficit brouhaha which resulted in the forming of a so-called "Super Committee" being set up from within Congress and threats of sequestration which have been carried out. Marked, upper right you see, "Sun rises with (Fixed Star) Ras Alhague (desire to heal a wound; to create balance), a star linked to Lincoln's natal Mercury (10Pis18) by paran for as Ras Alhague rose on his day of birth, natal Mercury was at Nadir showing that healing the wounds of the Civil War and of slavery is one of the primary actions he is most remembered for after death. If only such healing would continue! But now it's December 5, 2014 and the 6th of 7 exact Cardinal Squares between riotous Uranus and Pluto will perfect on *December 15th as protests and uprisings continue to occur the world over and generational clashes are fought, often with violence. In America we march against the brutality of the Police State--the same issue as in 1999 under Bill Clinton--as the energies stream forth from the Uranus-Pluto conjunction/s of the mid-1960s, the Civil Rights era--yet they are frustrated and blocked (square = 90 degrees) making conflict even more likely. 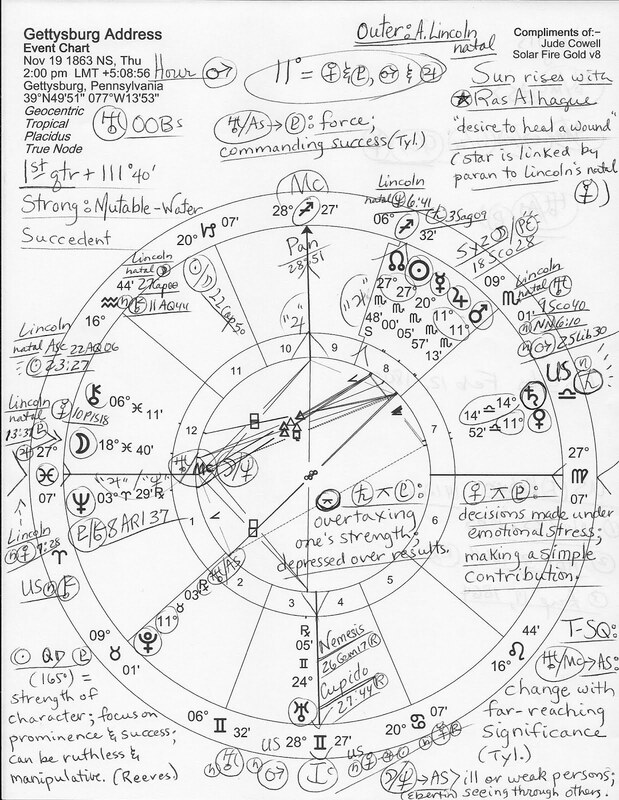 And making current matters more complex and confrontational than in the 1960s, America's natal Mars (22Gemini), the archetypal Warrior, turned retrograde (inward) by progression in the summer of 2006 though its punishing effects could be felt about two years prior to the actual Station Rx (18Libra.) This condition of our once-Direct Mars may be applied to many levels of society such as our wounded vets returning from wars (another legacy from the 1960s and 1970s), decreasing the size of the US military (if it's true that they are), the regressive politicians (mostly testosterone-driven males) trying to re-turn our nation to pre-Civil War days ("Oh, Rhett! "), violent acts perpetrated on US soil, the anarchists and zealots now undermining our government, Klan and Nazi activities--and obviously to a slew of police departments now trained to use excessive force against the American people...not to "protect and serve" but to "shoot first, ask few if any questions later." This includes state prosecutors who defend police officers who gun down or choke to death unarmed citizens rather than presenting the facts to Grand Juries--then prosecutors decline asking for indictments so that trials by jury may be held--such anti-societal 'good ole boys' of The Brotherhood come under the Mars Rx category as well resulting in combative Martian energy and motivation being turned inward toward our nation's own citizens with one of the power elite's goals depopulation and another to stack as many Americans into overcrowded privatized prison cells as possible in order to exceed shareholders' dreams of vast wealth. Oh, and criminalizing a massive jail population is also one method of keeping millions of marching males off the streets and under lock and key. Yet another Mars Rx image? A prisoner being held (often arbitrarily) in solitary confinement. Ras Alahague details from Brady's Book of Fixed Stars. Abraham Lincoln February 12, 1809 6:54 am LMT Hodgenville, KY.
*The 7th and final waning square between 'new' Uranus and 'ancient' Pluto occurs on March 17, 2015. After that date, their dynamic power struggles begin to ease up through resolution or exhaustion though other cosmic influences reflecting societal meddlings will manage to keep all pots stirred and simmering. But let us not forget that thanks to the 2014 Midterm Elections, the neocon war hawks are re-turning to Washington in January 2015--swords drawn and lands to conquer. How tragic for our nation that US Mars Rx also describes the voters who didn't excercise their right to vote on November 4, 2014--and the various election tricks and targeting of misleading campaign ads that helped Republicans 'win' a majority in the US Senate so that the Pentagon can happily re-turn to an expanding empiric war. They won't be sufficient but get the national credit cards out! Because World War III will cost us the world.